RoG is also known as "River of Grass"
Choose below study plans or full plans with full size patterns included. Optionally if you want the parts cut by a CNC machine, you can purchase the cutting files for this design. 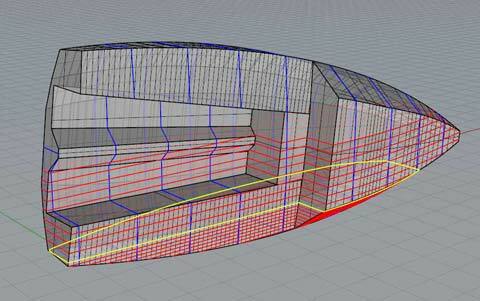 You will need the plans in addition to the cutting files to complete the boat. They say every design is a compromise. But we ask: If you can ride the edge, point and surf down waves like a dinghy, enjoy the safety and stability of a keelboat, gunk-hole in waters only kayakers can reach, sleep two comfortably and eat on a table that’s big enough for a full-size paper chart, where’s the compromise? Stability and weight are two overarching concepts of this design: Together they strongly define safety and performance, but they are potentially conflicting so I took the approach of combining lead and water ballast. 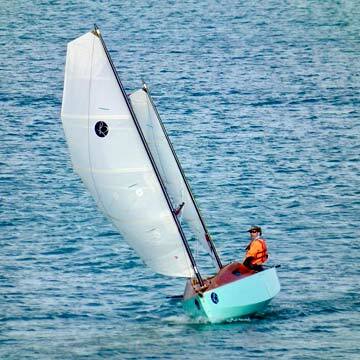 A 100lb swing keel provides ultimate stability while 80lb of water in either of two wing tanks adds versatility. The result is a range of positive stability in excess of 100° and the ability to accommodate various conditions: In light-air or windless conditions, empty tanks will lighten the boat and reduce wetted surface. For enhanced performance, the windward tank is filled, which will result in a significant increase in righting moment as well as ability to pound through chop. Finally, beanbag sailing will benefit from filling both tanks (which in effect means 160lb of water ballast, bringing the overall ballast to a respectable 260lb): the boat will now behave like a 25footer. Great for newbies, lazybones and exhausted raid-sailors. Both the keel and rudder are high-aspect ratio foils that minimize wetted surface while providing performance to windward. The rudder is balanced so will be light and responsive. 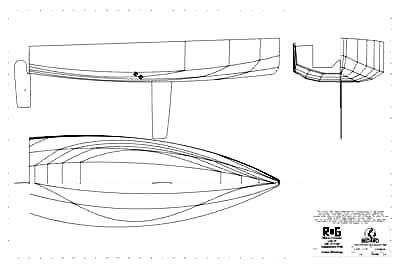 A given was that this would be chinned hull, built of developable panels. I spent a lot of time comparing various iterations and there is no way around the fact that bringing down that chine close to the waterline increases stability significantly, hence the slab sides. 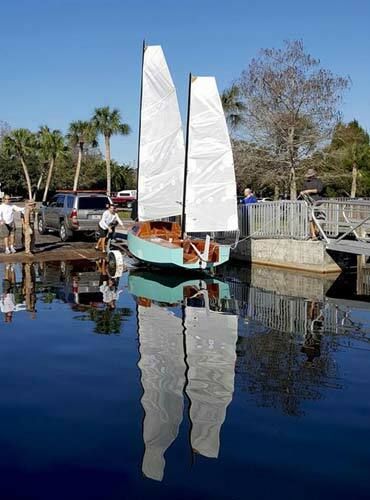 Ditto for the blunt nose; but it is a balancing act to achieve this while keeping the transom out of the water at all angles of heel and wetted surface to a minimum; as the latter is a strong indicator of light-air performance. So don’t be deceived by the boxy look, this is a powerful hull and can support a significant sail plan. If there is one topic on which sailors love to argue, it is sail plan. Many aspects have to be juggled: center of effort, center of gravity, aspect ratio, versatility and simplicity (both to maneuver and rig) are but a few. I chose the cat ketch for a combination of these factors. Carbon spars, which have come down in price in recent years, make this rig quite attractive, and a breeze to set up on the trailer. 150sq.ft. will bring the Sail Area-to-Displacement ratio to 24, somewhere between the Wayfarer and GIS, promising a fine ride to the thrill seeker. The devil is in the details and a lot of time went into this part of the design. There is sitting headroom in the cabin and a forward table can be lowered in two separate halves, to make bunks on either side. Two big self-bailing cubicles (and 4 cup holders!) in the cockpit, two watertight lazarettes and ABYC-compliant dedicated gas locker, for grill/outboard tanks adds comfort and safety. Full-length oars are stowed under deck and out of the way, accessible via a small watertight transom hatch. 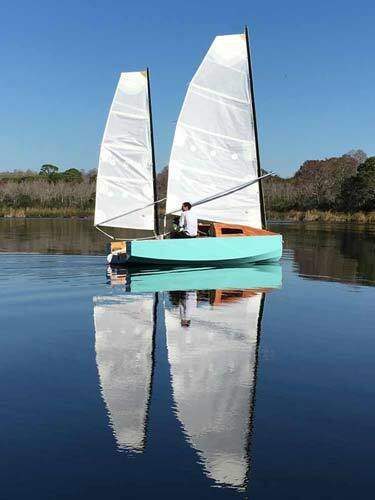 The companionway is a hybrid kayak-coaming/sailboat-companionway hatch: It is large enough that one can reach the bow anchor and main mast while standing in the cabin, yet can be covered with stretch canvas or wood panels for spray/rain/sun protection in various configurations. Completely open in fair weather the cabin is closer to a dodger than an oven. The boat is ABYC unsinkable, thanks to the use of flotation foam. She is designed to recover dry from any but the most catastrophic capsize. Indeed downflood angle is 108°, so no bailing for a tired crew. Centerboard and rudder systems are accessible and repairable underway, including keel-lift mechanism and rudder bolts. Both appendages will kick up undamaged upon grounding. We strongly recommend the carbon spars, but the sails do not have to be full-battens, nor do they absolutely need 2 reef points so there can be some savings there. The BOM as beow is comprehensive, with lines led aft, all the way to the hiking sticks. Beware comparing this to your barebones-run-of-the-mill equipment list on most new boats.